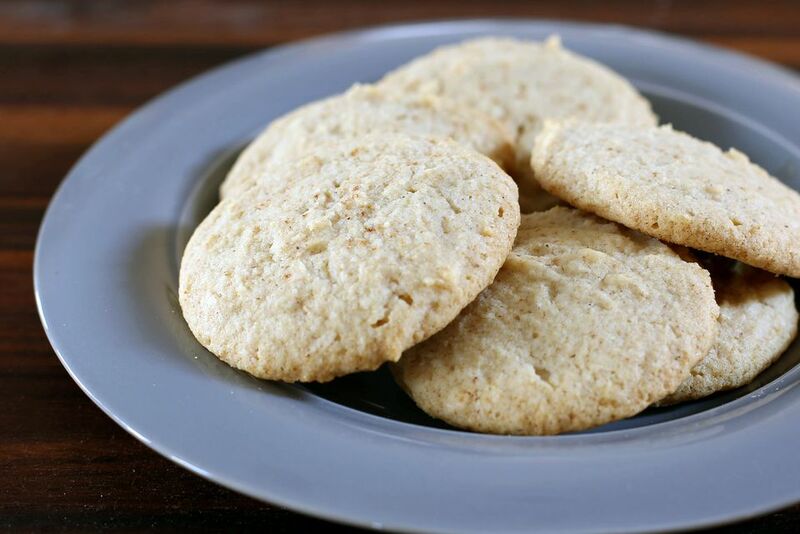 These eggnog cookies are made with prepared eggnog and spices. The cookies are perfect for tree-trimming and holiday guests. The cookies are very easy to prepare, just mix, drop, and bake. No chilling or extra steps are required. To dress them up a bit, press a pecan or walnut half into the tops of the cookies just before baking. Preheat oven to 300 F (150 C/Gas 2). Line baking sheets with parchment paper or a silicone baking mat. Or spray the baking sheets lightly with baking spray. In a bowl combine the flour, baking powder, cinnamon, and nutmeg. Blend well with a whisk and set aside. In a large mixing bowl with an electric mixer, cream sugar and butter until light and fluffy. Add the eggnog, vanilla and egg yolks; beat at medium speed until smooth. Add the flour mixture and beat on low speed just until dry ingredients are moistened. Using a teaspoon or small cookie scoop, drop the dough onto the prepared baking sheets, leaving about 2 inches between the cookies. If desired, sprinkle each mound of cookie dough with more nutmeg. Bake for about 25 minutes, or until the bottoms are lightly browned. Remove the cookies to a rack with a spatula.